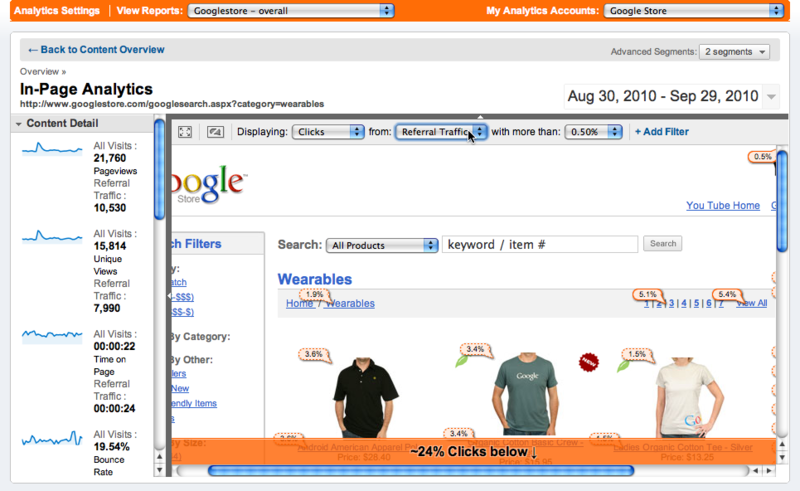 Google Analytics, now with visual in-page indicators! Google Analytics is an amazingly powerful web analytics solution which gives Webmasters in-depth information related to website traffic, trends, and how effective internet marketing campaigns are. Google Analytics can show you exactly how your visitors found your website, what links they clicked on once they were on your site, and how long they stayed. Using this information, Webmasters can tweak their websites to maximize the visitor experience and increase the return on investment on a website. Perhaps the most attractive benefit is Google Analytics is a free service for Webmasters — that’s right, no charge! 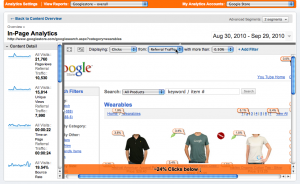 Late last week, Google released a new major feature to Google Analytics: In-Page Analytics. Previously, when looking at Google’s pie charts, graphs and reports, it proved to be tedious to convert their text data into visualizations to see how visitors would navigate a particular web page. To make the process easier, some Webmasters would open a version of their website and click through by mirroring user behavior with information pulled from Google Analytics reports. The manual work involved to fully understand user click behaviors proved to be a time consuming task for Webmasters. As a result, Google has addressed the problem and released their new In-Page Analytics feature in beta mode. With In-Page Analytics, the analytics data is now displayed right on a given website so a Webmaster can see actual analytics data as they browse. To access the new In-Page Analytics feature, just look in the Content section of your Google Analytics account. Do you think this new feature will make analyizing your traffic data and click behaviors easier as a Webmaster? Share your thoughts in the comment section below. Richard Ward is a Sr. Web Applications Developer for OurChurch.Com. Richard's professional background is in LAMP style web development. Richard is also a technology enthusiast with a strong interest in emerging technologies. You can reach him at richard@ourchurch.com or on Twitter at @OCCRichard. This is extremely interesting, You are an excessively professional writer. I’ve joined your rss feed and stay up for on the lookout for even more of your great publish. Also, I’ve shared your blog in my web sites!